From September 2018, the French government will enact a ban on all mobile phones in schools for children under 15 years old. Students will not be allowed to use their phones at any time during the day, not even at breaks, meals, or between lessons. There have also been talks in the UK of implementing a similar policy. Since 2007, teachers in the UK have been legally allowed to confiscate students’ phones. There has been a lot of debate over the ban and its effect on students’ learning since the announcement of the law. It is estimated that around 93% of French students aged 12-17 years old own a mobile phone. Surely then, a large-scale ban is going to be difficult to implement when dealing with such a large number of students and phones. How will schools ensure that no students are able to access their phones during classes? Will they check students’ bags when they arrive? Where will schools store the phones once they are collected? Will there be lockers or a deposit box? Some of the most popular phones in France are iPhones, which retail anywhere between €769 and €900. With the average class size being about 23 students, if every student had an iPhone, each teacher would be responsible for €17,687-20,700 worth of technology every day. Therefore, each school will need to implement policies to deal with any devices should they be lost, stolen, or broken while in their care, as well as plans to securely redistribute each device to its correct owner at the end of the school day. There is a lot of room for error when each teacher is responsible for almost 20,000 euros worth of privately owned technology daily. There have been conflicting studies about the risks that mobile phone use poses to a student’s education. A study from the London School of Economics showed with phone restrictions, students’ test scores increased six per cent. However, another study by researchers in Singapore concluded that prolonged separation from smartphones can cause anxiety and unnecessary stress on students who fear social isolation. Many students suffer from a fear of missing out (what has colloquially become known as FOMO) and need to check their social media feeds and messages at periodic intervals to feel a sense of calm, which this study showed. Andree Hartanto, a researcher at Singapore Management University, says, “a blanket restriction on smartphones in school is likely to be more harmful than beneficial, because smartphone separation triggers anxiety that, in turn, adversely affects students’ cognitive functioning.” Some may say total ban policies are harsh and restrictive, however there are many benefits from them as well. Jean-Michel Blanquer, the French Minister of Education, believes that the ban will not only increase students’ focus in the classroom, but will also help with their mental health by combatting cyberbullying. When New York City mayor, Bill De Blasio, lifted a 10-year phone ban in all NYC public schools, the instances of cyberbullying increased by 351%. A study shows that by banning phones, students on average gained an additional hour per week learning rather than being on their devices, which equates to five additional days at the end of the school year. This “extra” class time has been especially helpful for low-achieving students, who could benefit from more educational time. When about 90% of British teenagers own a mobile phone, a countrywide ban would face similar challenges to the new French law. 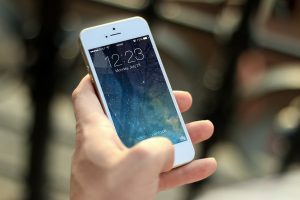 The potential benefits of a complete phone ban such as an increase in test scores, outdoor social interaction and a decrease in cyber bullying are met with potential drawbacks like increased social anxiety, a lack of technological readiness for the future and not utilising all possible learning avenues. However, the UK and its teachers are still split.